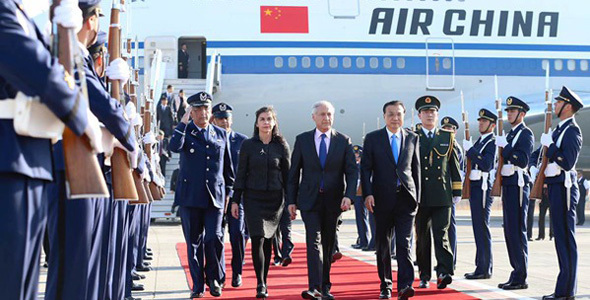 Premier Li Keqiang arrives at Santiago on May 24 to kick off his official visit to Chile. Hopes have been voiced by senior officials and experts that the free trade agreement between China and Chile will be upgraded to cover more products and bring more tax cuts. They were speaking as Premier Li Keqiang is set to begin a trip to Santiago, the Chilean capital. As the fourth and last stop of his visits to Brazil, Colombia, Peru and Chile from May 18 to 26, Li will hold talks with Chilean President Michelle Bachelet, attend a signing ceremony for cooperation pacts and meet the media with Bachelet. Chile was the first country in Latin America to sign a free trade agreement with China, and this year marks the pact’s 10th anniversary. Both leaders will witness the two countries signing of cooperation agreements in fields such as politics, economy, trade, finance, culture, science and technology. In Latin America, Chile is China’s third-largest trading partner, second-largest source of imports and third-largest export market. Last year, the bilateral trade volume reached $34.1 billion. Assistant Commerce Minister Tong Daochi said that since the China-Chile free trade agreement took effect, bilateral trade has increased fivefold. 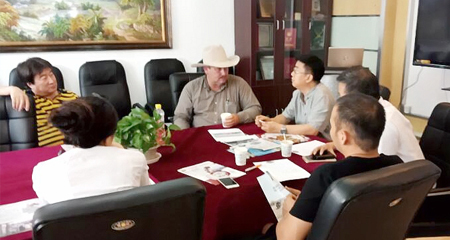 During the visit, the two countries will discuss further completing construction of the free trade area, Tong said. The goal is to “comprehensively deepen bilateral economic and trade relations and bring more benefits to enterprises and consumers in both countries”, Tong said earlier this month. Li Baorong, the Chinese ambassador to Chile, said the free trade agreement has additionally diversified trade, with an accompanying increase in the number of Chinese automobiles entering the Chilean market. During the visit, Li will also attend the opening ceremony of a seminar marking the 45th anniversary of the establishment of diplomatic relations between China and Chile and the seventh meeting of the China-Chile Business Council. The premier will deliver a key speech at the United Nations Economic Commission for Latin America and the Caribbean.